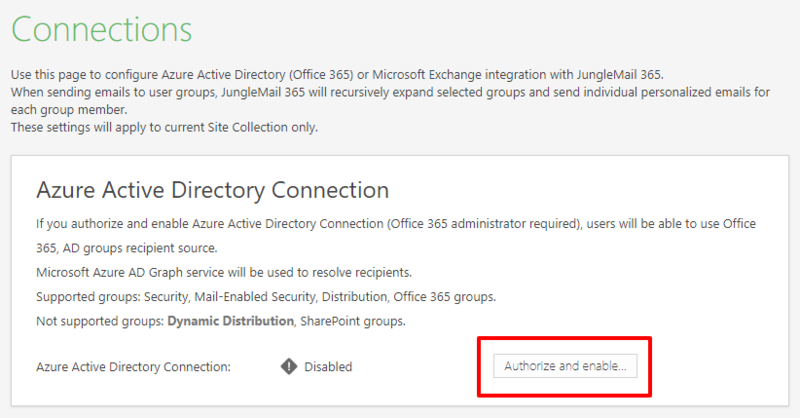 It is easy to configure Azure Active Directory (Office 365) users and groups with JungleMail for Office 365. In this tutorial, you will learn how to set this up. Note: you should have a Tenant Administrator permission role to see and modify these settings. 1. 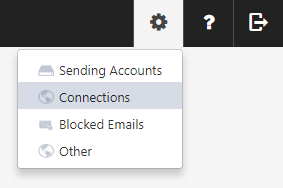 To begin, launch the app and click the settings wheel icon in the top right corner, then click Connections. 2. In the Azure Active Directory Connection section, click Authorize and enable. These settings will apply to the current site collection only. Now that you have enabled this feature, users will be able to pick Azure Active Directory Security, Exchange Distribution and Office 365 groups as a recipient source. When sending emails to a user group, JungleMail for Office 365 will recursively expand selected groups and send individually personalized emails for each group member.